The Harvard based Berkman Center for Internet & Society recently published a report entitled ‘Youth and Digital Media: From Credibility to Information Quality’. It uses a promising contextual framework to assess a broad body of literature focused on the information seeking behaviours of learners 18 years old or younger. Both of these areas are a key part of our JISC funded Digital Visitors and Residents project which is interviewing and surveying learners from four educational stages which span late-stage secondary school, through university, to experienced academics. By using the Visitors and Residents principle as an underlying framework I believe we are beginning to gain an understanding of the answer to question 1 and we are certainly discovering some of the key factors within question 2. For me ‘content creation and dissemination’ would involve the expected blogging, media posting and commenting etc but should also include tweeting, posting to Facebook and other forms of interpersonal contact/expression online. Content ‘creation and dissemination’ in this sense is closely linked to the notion of a Resident mode of engagement. This is especially relevant when considering the role of creativity as expressed in question 1 i.e. what is the individual contributing when they make, modify and/or share? Plotting our participants engagement with the web along the Visitors and Residents continuum makes visible the common dislocation between these Resident style literacies often employed in a personal/social context and the more Visitor style literacies employed by learners academically. There are areas of cross-over such as what I have termed ‘Emergency Collaboration’ and the occasional participant who has an active professional/social network online. Generally however what we are finding is a range of ‘learner owned’ Resident literacies which are not officially valued by higher education institutions. 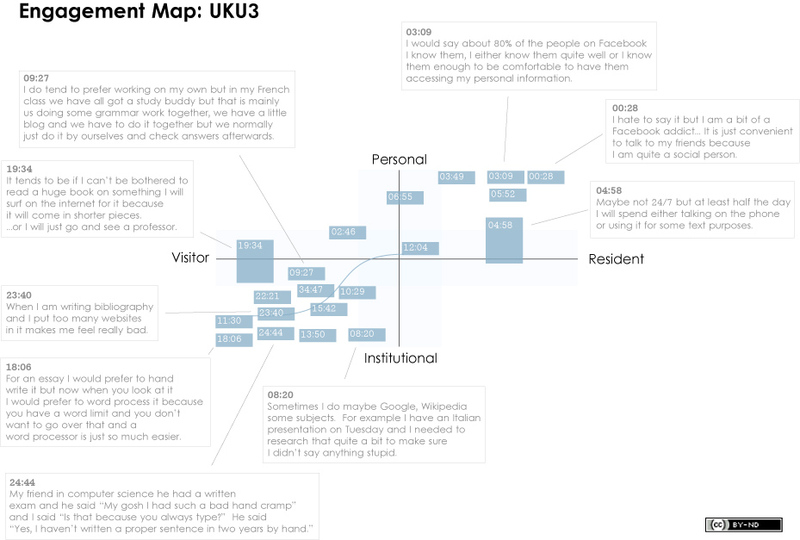 V&R mapping of a UK university participant showing a distinct division between 'Institutional/Visitor' and 'Personal/Resident' activity. It could be argued that this is not a problem and that Visitor style approaches are what we should reasonably expect to employ during our formal studies. However, if as the Berkman report suggests an ‘increased creative interaction with information’ has a positive influence on learners ideas about information and how to find it then understanding and ‘leveraging’ Resident literacies becomes extremely important. The first of our 4 educational stages is the ‘Emerging’ stage which includes late-stage secondary school (from 17 years old) through to first year undergraduates. I was keen to include this ‘bridging’ stage in the project as I felt that historically there had been too hard a distinction between the educational research carried out with schools and that carried out with universities. It was almost as if we thought of these learners as two different species rather than individuals who normally only have a gap of a few weeks between these two forms of education. Our early findings indicate that learner’s information and digital literacy practices do not alter significantly as they enter university. This is why it’s so important for the higher education sector to take note of reports such as this, reports that give an insight into the information and digital literacies of incoming students who are unlikely to significantly modify their approaches to the web in their first years at university. This entry was posted by David White (@daveowhite) on Friday, February 24th, 2012 at 3:17 pm	and is filed under Digital literacy, JISC, research, teaching and learning, Visitors and Residents. You can follow any responses to this entry through the RSS 2.0 feed. Both comments and pings are currently closed.